When I was a child, we lived for a time in the U.S. Midwest. One autumn, I had the great good fortune of experiencing the migration of the monarch butterfly (Danaus plexippus). I didn’t even have to go on a field trip – the migrating flock flew right through our schoolyard in suburban Milwaukee, Wisconsin. The red brick school building, the featureless green lawns and black asphalt were, for a short time, obscured and transformed into a bright fluttering cloud of orange and black. We were led outside, class by class, to bathe in the butterflies. Of course, our science teacher couldn’t let a chance like that go unwasted, so we were also provided with capturing jars and small amounts of chloroform. Thus we became one more migratory hazard on the monarch’s annual 2000 mile (3200 km) trip from Canada to Mexico. 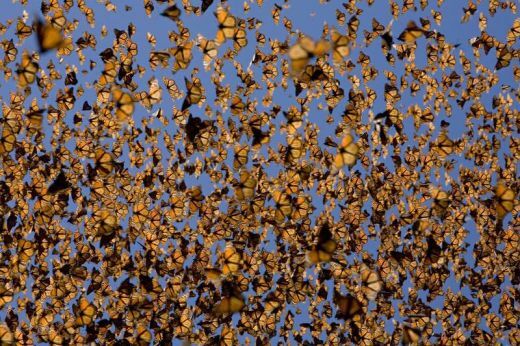 The monarch’s winter breeding ground in Mexico was discovered in 1976, allowing for better assessments of the overall population. Regular monitoring only began twenty years ago. And the overall trend for the past decade has been downwards. According to this National Geographic article, the main causes are temperature extremes due to climate change, and the loss of the monarch’s main source of food as well as host plants for monarch eggs, the milkweed (Asclepias genus). The milkweed, a flowering plant with milky sap that is toxic to most animals, imbues the monarch with a natural defense – the butterflies themselves become toxic to predators. The once common milkweed has been eradicated over large stretches of the Midwest, partially due to herbicides and partially due to land conversion to farming. Monarchs are often seen around corn and soy fields where milkweed no longer exists. What caught my eye was a comment on the National Geographic article: “Monarch butterflies and other pollinators (are) actually abundant and doing well in the herbicide tolerant GMO corn and soybean belt of the upper Midwest USA.” The commenter provides as proof a video he shot last year of hundreds of monarchs in a field. It’s hard to argue individual experience of abundance, even against evidence-based measurements taken over the course of years from various locations along the migratory route and the mothership grounds in Mexico. When I was a kid and standing in that multitude of butterflies, it would have been virtually impossible to persuade me that the overall butterfly population might be in decline, or ever be in decline. Objectively, it felt like I lived in a bountiful universe of soft wings and color, but as it turned out, it was just a moment.